I feel a lot like that right now. 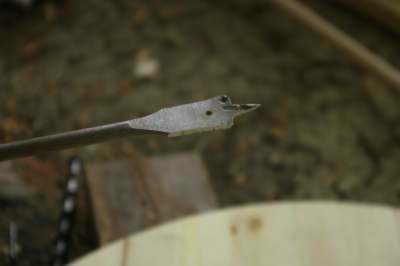 Got the wheel rounded – medieval craftsmanship is all very well, but I’ve always been a fan of power tools in the shop. I sidled the wheel up to Raven’s tabletop belt sander and spun it against that for an hour. (no pictures, not enough hands.) Re-dug the belt groove (dremel tool) and spent the next million years (six hours) experimenting, tweaking and adjusting, and making the occasional obscene gesture. And when all the dust settled (wow, do I have to vaccuum) here’s what I’ve got: A very basic castle wheel standing 3 feet high, 20 inch wheel circumference (outer edge), double treadle, single drive. And it totally works. I’m so happy I could plotz. Plus I was relieved to find that actual act of spinning on a wheel is not hard – I was, I admit, experiencing some concern that having actually built the thing I was going to have to find someone to show me how to use it! But it really is just like drop spinning, only faster. And sideways. And with feet. 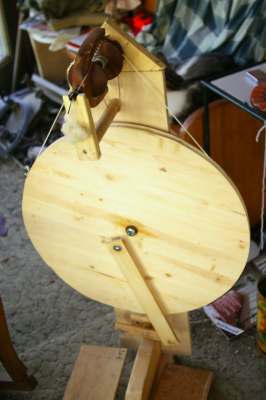 I also gave myself a little break while learning it – I had some singles waiting to be plied from the drop spindles, and so the first thing I did was ply those together, which let me get used to the speed of the wheel and the whole treadling thing without actually having to draft at the same time. By the time that was done I had the spin/draw thing worked out and felt confident enough to move to the actual fibre, and had no problem at all keeping it even. 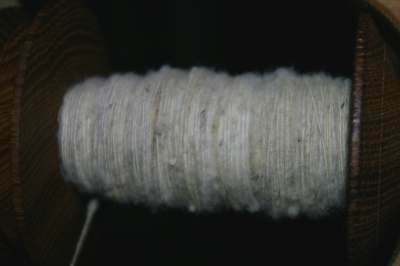 The singles in that picture are my cat-brush rolags from the recent fleece haul. I did try setting up the double drive band, but it won’t stay on – I’m not sure whether the wheel itself is too narrow, or whether I just don’t ‘get’ what I’m supposed to be doing there. But the single drive works great. The wheel and I had a debate/consultation/insult-shouting competition yesterday morning and managed to settle on a length of twisted cord made from heavy nylon thread to use as a yarn break, and that was the final refinement before it all came together. I think the single drive is best for now anyway, as I don’t have a “Mother of All” or equivalent, there’s no way to adjust belt tension at the flyer, so the yarn break is doing some pretty important stuff right now. That may change on either another wheel or even on this one if I do make my own flyer somewhere down the road, but right now it’s working fine and I just don’t see any reason to mess around with it! Thank you so much, everybody, for your compliments, suggestions and encouragements! This has been a really fun project, and so rewarding, and I have to recommend it to anybody who is even thinking about giving it a try. As far as the actual building of it – there is probably a lot of math involved in getting all these round things and moving parts to be in the right relation to each other. I wouldn’t know. Literally the only formal measuring I did was in marking out the actual wheel circumference – and then as noted I messed up cutting it anyway and had to sand it down A Lot to make it be round. Fortunately I erred on the outside of my line – the wheel was always supposed to be a 20 inch round, and for a wonder it actually still is! Other than that, I looked at a lot of pictures of a lot of wheels – Louet in particular has assembly instructions for their wheels with nice black-and-white line drawings. 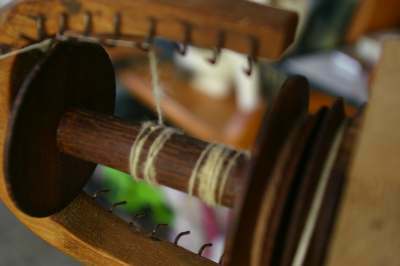 Lendrum has the kind of treadle assembly that I used, and there are some good pictures of that. Ashford puts the same elements together in a bunch of creative ways and so are a great source of inspiration. And, after staring at all these images, I just started holding things up in relation to each other and moving them and tying them together until everything was in a place where it wouldn’t rub or bump anything else, and could do whatever thing it had to do freely. I used thin slices of broomstick as spacers for the footer (on the wheel) and the treadle connector hinge. The wheel axle is a 1/2 inch bolt, and the centre of the wheel has a 1/2 inch copper pipe hammered through it to make it run smoothly and protect the wood. You can get this really wicked looking drill bit for drilling the axle holes – Raven had one, but if you don’t then it is worth picking one up – they’re only a few dollars and you get a big round perfect hole, which saves a lot of tweaking in a very awkward and important place. I bought a big 20 inch “furniture grade” board to cut the wheel out of, because I figured trying to assemble my own round from parts was more than I could handle on this first try. 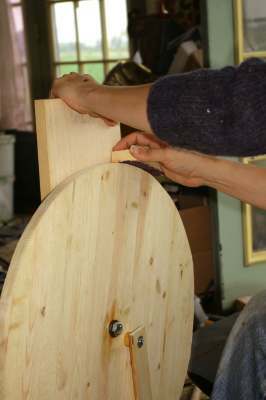 The plank on which the wheel is mounted is a maple board, but could be (and might even be better as) a couple of two-by-fours, or whatever – the important thing is that it’s solid, because everything else is mounted onto that. The rest of the bits are the usual “stuff I found” – chopped up an old drawer for the treadles, used a dowel for the treadle hinges, and a small piece of oak for the connector hinge – I had that left over from making busks for a show, but again it can be purchased quite cheaply. I didn’t have enough of the oak to make the footer out of it as well, so I glued two poplar strips together and drilled through them as one piece. Everything is greased with Vasoline, and everything is screwed-not-nailed together. The treadles are tied to the connector hinge with 4 inch lengths (plus knots) of bootlace. They are also currently tied to the dowel hinge, which works but I think I’m going to change that to two small pieces of wood that hook over the dowel instead, so they’ll shift less. (Raven’s suggestion). As mentioned, I did not make this flyer, but I’ve been staring at it for a long time now and I’m quite certain I could. The horseshoe shape would be easy to cut, but isn’t even necessary, I’ve seen square ones. The rounds are the tricky part, and probably best done by some time with a lathe, but mine are 3/4 inch discs sanded thinner at the edges and then of course grooved (both bobbin and flyer wheel on mine have V-grooves) and with patience there’s no reason they couldn’t be done the same way as the drive wheel if you had to. I’ve been browsing obscure hardware stores for months looking for something that would act as a yarn guide (what is it actually called? The bit where the twist goes into the flyer?) with a few possible contenders but no perfect solution, but honestly I think the first thing I’d try would be to carve it out of wood and sand the heck out of it. 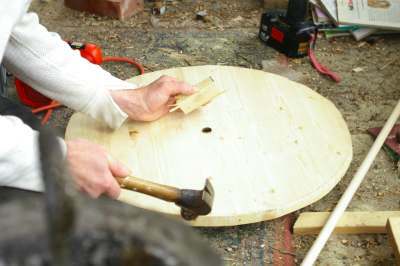 It really only needs to be a dowel with perpendicular holes drilled in – tricky work, but far from impossible! So I know all that is not the same as publishing “plans”, but if you’re interested in doing this, with or without bought plans, and you have any questions, feel free to drop me a line. I’ll answer any questions I can, and can could always send detail pictures if something isn’t clear. Now I’m gonna go spin something. 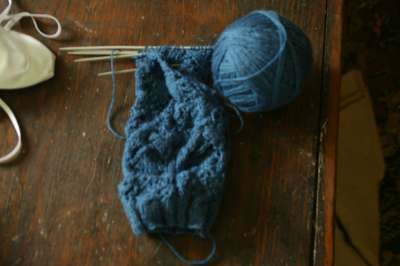 I am slowly making my way through heat wave sock number two. The lace chart is definitely ok, I haven’t got to the text yet but will be there shortly. I’ve been knitting it almost exclusively in the car as we bounce to windsor and back, because at home I haven’t been knitting at all. I’ve been doing Other Stuff. The last time Emily and Dru were here, we were talking about ‘stuff’ – fibre tools, home improvements, just basically how long it can take and how much it can cost to get or do the things a person wants or needs. Emily observed that anything you want has a certain set ‘cost’, but that the cost is divided between financial investment, time investment and labor investment. You can work harder, which takes time but saves money, you can wait longer (to save up), and spend money but save effort, or you can spend a bunch of money right up front and save yourself a lot of time and work. It’s all ratios. I don’t have a lot of cash, which is why I’m always making things from whatever is lying around. I do however have gobs of time right now, as summer is a lull season for my business, and a lot of what I need to do around the house depends on having it stop raining for ten minutes so that Raven can do what he needs to do first. So for a miracle, this summer I am actually managing to accomplish the one thing I really wanted to do for myself this summer. I started this project on Sunday, and worked on it all day. The rest of the week I’ve only been able to grab a couple of hours here and there, so I think there’s probably about two full days of work in it so far – and it isn’t done yet by any means, it’s just to a point where I can feel confident that it will work. Which is nice – until yesterday I wasn’t sure that I wasn’t putting a lot of work and wood into a big ugly mistake! Basically what’s left to do is to make the wheel be more round. Which is hard, since I haven’t got a “make wood be round” tool. But fortunately, the whole point of this project is to make the big round thing spin on its hub, which means that as of now it is able to act as its own lathe. A depressingly slow but provably effective method of rounding it off. It’s a two-pedal wheel, right now the flyer I’m using is an antique I picked up in the spring to find out how that worked exactly (this was before I found Emily’s wheel), which is set up for double drive but currently being used as a single drive with a scotch brake because having a double belt fall off would be even more annoying. I will probably eventually make my own flyer, but this one works fine, so there’s no rush. What I will desperately need is more bobbins, but I’ll worry about that when I’ve solved the wheel problem! Raven has helped me some – he cut the copper sheathing for the hub, and some of the longer cuts in the wood as well, since he has more of the “Make Cut In Wood Be Straight” skill than I do. 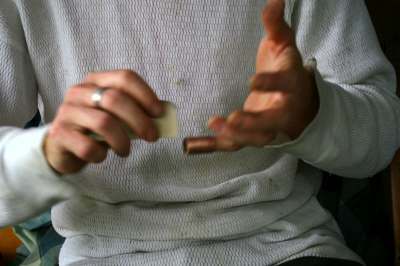 But for the most part I have actually done this myself, and I have figured it out completely by myself, because the times when I did ask for advice/begin thinking out loud, Raven insisted that he had no idea how a spinnning wheel worked, nor did he particularly want to know, and thus couldn’t offer useful advice. Yesterday he admitted (in the kindest possible way) that he really didn’t expect the thing to work, and is totally impressed that I managed to build it. Which gives me the incentive I very badly need to go back to the slow, slow job of sanding this sucker. I will try to go into more detail about how it goes together when I have confirmed that it is all completely working. There aren’t any ‘plans’, because I was pretty much making it up as I went along, with revisions as necessary when things didn’t work. Which happened a lot less than I was expecting, actually, but still definitely happened. There are already things I would do differently, were I to go insane and do it again (a definite possibility at this point, because Making A Machine is so TOTALLY COOL I cannot get over it) but the important thing at this point is de-bugging this one. There’s a comment from Beth – in case you didn’t see it she is setting the record straight; actually her husband Chris is the one who wrote the wool combs tutorial. So thank him very much, too! Went to Windsor, had a very good visit with Raven’s grandmother. Came home. Got a phone call Thursday from his parents, to the effect that the (insane?) doctor had decided to insert a feeding tube. Went back to Windsor. Horrible emotional distress for everybody ensues. Meanwhile grandmother looks pretty darned good for a 92-year old dying person, and will shuffle off this mortal coil when she’s darned good and ready, and not a second before. Thanks to those of you who sent notes and well wishes, I appreciated your thoughts. 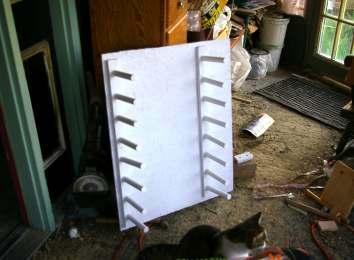 A backing board – I used a chunk of chipboard, about 25-30 inches – more about the size at the proper time, but this should be PLENTY big enough. 16 8-inch pegs of a fairly large gauge – I used broomstick, which might have been overkill but maybe not – they will be taking some stress. Two pieces of one-by-two or similar on which to mount the pegs. These should be around 30 inches long, or the length of your backing board. Two skinny pegs, or at least pegs for which you have a matched drill bit. No matter how you mount the rest of the pegs, these last two are going to have to be removable. Paint and varnish as desired. 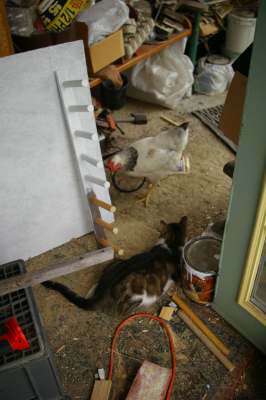 That chipboard was left over from the chicken coop project, and it was getting all warpy leaning against the house. So for its own good, I co-opted it. It is somewhere in the area of 25/30 inches. next we sawed pegs – there are 16 of them at 8 inches, cut out of broomsticks. Notice how the “we” crept in there? Raven is supposed to be plumbing, and he hates plumbing. So he keeps helping me do things, to postpone the moment when he must crawl back under the house. I am lousy with a handsaw, so I let him. Sand these pegs as smooth as you can, so they don’t have slivers that will catch yarn. The pegs generally could probably have been mounted on the backing board directly, but a) it wouldn’t look as nice and b) my backing board is as already mentioned a warpy piece of chipboard. So I drilled holes in the ends of the pegs (oddly, I get a lot of practice at that, I’m becoming not half bad at it!) and screwed them to these chunks of one by two that were leaning against the house for some reason. NOTE – the proper way to mount these would be to drill holes that the pegs fit into, and sand it all up pretty, and then the pegs can be moved or removed at your pleasure. That would be really practical and nice, and if you feel like putting the effort into it I’ll be very proud of you. I’ll do it myself, too, if I ever get materials that are worth it! You’ve already figured out, by measuring half a sock round’s worth of yarn, how widely your pegs should be spaced for sock dying. That tells you how far apart these sticks that you’re mounting the pegs to should be, but what about the pegs themselves? I got real lucky, because my measurement came out so close to 18 inches. Which means the wrap for a sock stripe is just over a yard, and a yard is an easy thing for me to think in terms of. (as opposed to “43 inches” or something awkward.) But you’re stuck with whatever you get. Point is, you want the measurements TO BE something you can work with easily in your head, and you want this thing to be as versatile as possible. Your best bet is to space the pegs so that your distance is travelled diagonally from the top peg on one side to the second peg on the other, and so on. This lets you skip every other peg when wrapping, and gives you plenty of space to work in. The other pegs are just kind of ‘extras’ in case you – oh, I don’t know, have 600 yards of silk plies taking up space on a drop spindle somewhere and really want to chain it for a loom. For example. Ok. Now the last thing about mounting those pegs is – your board is longer than you need it to be, and your 1x2s are as long as your board, right? If so, hack off a chunk from each – just a little square – which will become the mount for those skinny pegs I was talking about. If you haven’t got enough, use something else – it’s a very small piece you need. I had some help at this point. No, there is not actually a chicken living in my house again. She is one of the MommaHens, and she just needed some quiet time. Anyway, that’s really about it – the worst part is deciding (not “figuring out”, just deciding) where you will be best served by having pegs. And, if you actually did mount them properly so they could be removed, you wouldn’t even have to do that, you could just drill a bunch of holes and figure it all out later when you actually need something stretched. Now, screw the mounted pegs to the backing board. Drill holes for those little pegs (remember I told you to get something you had a drill bit to match) in those two ends of wood, and mount one roughly centre at the top (above the rest of the pegs) and one rather to the left of centre at the bottom (below the rest of the pegs). My chunks of leftover wood were large enough that I could drill two holes, so one hole is at the level of the upper (and lower) pegs, and one above (or below) them. What these pegs are for is to create tension on the yarn or plies, because you can’t pull out any of the other pegs if you’ve mounted them like I did. So when it’s all warped, you can pull out one or both of these little pegs and the yarn (or plies) will relax enough to slide off all the other pegs. Unaccountably I don’t have a picture of it with these little pegs in place, I’ll try and remember to take one. My plan is actually to measure all the possible distances between pegs, and write them on the jig in different colors with lines showing where that measurement stretches. That way it would be really easy to see where to wrap if you wanted (x) yards of fabric or (x) stripes of color, and you wouldn’t have to figure it all out again. I don’t know if that is actually going to happen though, because I’ve already started (with further help and consultation from Raven, as it was raining) another project, also related to the huge backlog of plies on my drop spindles. This is the summer for building stuff, tell ya true – and while I think this current project will be the last for the summer, it’ll be a doozy! (Unless I completely screw it up, of course!) More on that next time! and it seems to be working out fine. I’m saving the “good stuff” right now. Because that’s what the good stuff is for, right? In case the Queen comes along and needs a sweater, or something? I don’t know, I’m just saving it. She’s a good lady, with a great sense of humor and a generous heart. I’ll be sorry to lose her, but knowing her it is impossible not to respect and understand her wishes about dying. I’m glad that I knew her. 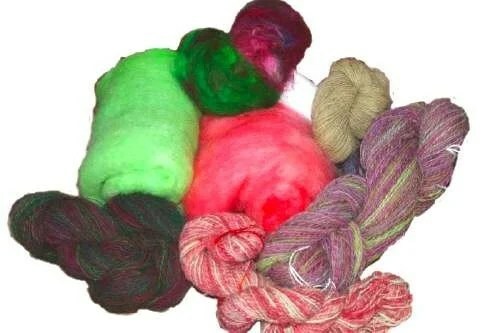 I was talking to Emily this morning, and among other subjects whining about not having a drum carder. ( I do not need a drum carder. I just want one because I think they’re neat.) The cat brushes are an awfully plodding way to get through my pile of fleece, however. Knowing that I like top better anyway, as we were talking about my attempts to comb it Emily remembered that she’d found a great “make your own combs/hackle” post, and sent it to me. So there’s absolutely no point in my telling you exactly step-by-step how I spent my afternoon, since Beth says it so well and so wittily that you should just go read her tutorial. In fact, you should go read it whether you want to make combs or not, because it’s so funny! But they’re generally the same. I even had epoxy resin left over from the masks. And I know they will work because the first thing I did was line up the nails and test them, and they made wool be nice. Now I’m not-at-all patiently waiting for the epoxy to cure so that I can play with them. View from my window: Mommas and babies chasing sparrows out of their little yard. I’ve started letting them outside the fence in the evenings, after the others have mostly gone to bed so they don’t get mobbed. So far nobody has been too interested in beating up baby chickens, but the MommaHens are suspicious and will start fights. Baby chicken #1 is a mighty hunter, and can catch and kill crickets the size of his head! Baby chicken #2 is a big wuss, and won’t even believe bugs are food unless Mommy says so first. And(!) a pdf pattern for said sock, which (if it were possible to miss it) is in the Giant Green Thing currently flashing and generally behaving offensively in my sidebar, there. I do not like the Giant Green Thing, I do not plan to keep the Giant Green Thing. But I’ve tested it, it works, and so for the time being it is a way to get the pattern, and I’m not going to muck around any further right now, because doing so would be a way of procrastinating posting the pattern and as we all know, that way lies badness. So. I’ve never done this whole lace-pattern-writing thingie before, but the format is yoinked from sock patterns that make sense to me, so hopefully they will make sense to you, also. I’ve cast on sock number two and will be knitting it from this (legible) version of the pattern, so if I come across any errors I’ll make the changes and let people know, but since I’ve already done this once I’m more likely to miss errata, so if you decide to knit this and find something horrible, don’t just curse my name, let me know too! Stuff! Is being done! By me! Which means really I should be able to post the pattern any old when. I like to do short-row toes, so there won’t be any surprises there, (and if you don’t like short rows do the other kind, it won’t interfere!) and it’s just st. stitch after the lace pattern ends, so length is adjustable. I’ve got both charts printed and checked and doodled on, and I’ve already started typing out the information and instructions, and I didn’t wimp out on the journal halfway through like I did with the cable socks, so it’s all there to be typed. So while I’m sure there are more important things I should be contributing to the world than yet another lace sock pattern… that’s what you get. Oh, there is an update on the tree bog page, (yes, if you hadn’t noticed my toilet has it’s own page) because it has been installed and is working! Hooray for functioning facilities! Hooray for slightly more distance from one’s own waste products! Ok, I’ll stop now. Point is those of you who visit me occasionally might enjoy it more this way!